Welcome to episode 142 of the LJS Podcast where today we are sitting in on a coaching call with 30 Steps to Better Jazz Playing student, Dan Sich. Dan asks how he can better outline chord tones, guide tones and other techniques without losing focus and getting off track. Brent gives out some exercises that take things in a slightly different direction. Listen in! Today’s episode is a coaching call with a 30 Steps to Better Jazz Playing student, Dan Sich. Dan is a guitar player and we have a great conversation about his playing and some things to try in the practice room. Sometimes the things we need to help us improve aren’t more of the same thing, but a different angle. That was the direction I went in when Dan asked how he could better outline chord tones, guide tones, and enclosures in his jazz solos without getting distracted and relying on things his fingers are used to playing. Ultimately, Dan wants to be able to hear the chord changes come out in his jazz solos better. He’s been working on the techniques that can help him get those sounds in his ear, but now he needs to exercise his ear and put some of the theory on the backburner. 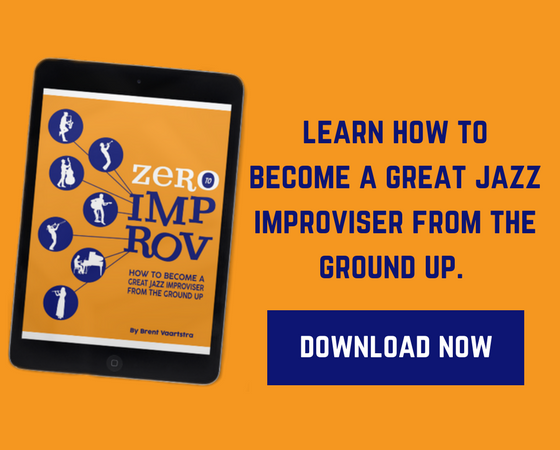 We go over a few different exercises that will help start training his brain to think more freely while improvising and focus on creating melodies. We also discuss a composing exercise that will help him use his ear and help him incorporate some of the techniques he’s learned into his lines. Dan and his journey as a jazz musician. A playing “free” exercise to help focus on only creating melodies. A composing exercise over ii-V-I chord progressions. Dan’s tips for other jazz students and what’s been working for him. I really appreciate Dan for being vulnerable and doing some playing on the show. He had no idea what I was going to ask him to play and he rocked it! I would encourage you to consider some of the exercises I went over in this episode. Knowing theory and conceptualizing jazz language is important, but what we do with it to make it musical is what matters most. I am so thankful to Dan for having the courage to be put on the spot and be okay with baring his playing to the world. I really liked some of the ideas he played on both exercises, by the way. Both of those exercises are something that I can incorporate into my practice routine. This episode was a great idea, Brent! Please follow up (if you haven't) and do another episode with him. I found this podcast really inspiring. I share so many of the same experiences Dan described. I appreciate his willingness to be "put on the spot" for our benefit, and I thought Brent's comments and suggestions were excellent. I am going to try some of them immediately. Many thanks you guys. Glad you found this helpful, Barry! Thanks for sharing your podcast setup, Brent. I can tell you with certainty my guitar sounds nothing like that plugged into ProTools! You seem to get that beautiful, woody sound, with no rumble in the bass and remarkable consistency of tone across all six strings. (It probably doesn't hurt that you have impeccable picking technique!) I've heard good things about the Ibanez hollow and semi-hollow series, so I'll definitely check them out. Keep up the good work, and I'll continue to be a loyal reader and listener. Hey John, indeed tone does have a lot to do with how you actually play rather than the instrument itself or the gear, though that plays a part as well. Really enjoyed the podcast, Brent. One thing that really struck me was the sound of your guitar. It's really beautiful and very close to what I'd like to achieve. Can you talk a bit about the instrument itself, including the pickups, and the amp you used? Hi John, glad you enjoyed it and thanks for listening! For the podcast I don't use my live setup or an amp. I plug directly into ProTools and just add a touch of compression and some reverb. The guitar is an Ibanez Art Core AF95. What a great idea for a podcast and thanks To Dan and Brent for sharing this. It’s such an enrichment to experience this one-on-one. Aspiring jazz musicians such as myself need ways to connect with other musicians. LJS is such a valuable resource. I can’t think of a better way to break down the barriers of solitary confinement. Hey Steve, glad it was helpful and thanks for listening! Hi Dennis, absolutely! That's why I love doing podcast episodes like these and will be doing more. We can all relate to these things and work through them together.